To Cite: Khanjani N, Rastad H, Saber M, Kalantari Khandani B, Tavakkoli L. Causes of Delay in Seeking Treatment in Iranian Patients with Breast Cancer Based on the Health Belief Model (HBM), Int J Cancer Manag. 2018 ; 11(6):e61383. doi: 10.5812/ijcm.61383. Background: Breast cancer is the most common cancer among women worldwide. Objectives: Regarding the effect of delay on survival in patients with breast cancer and the high incidence of delayed presentation in these patients in Iran, we decided to study the factors affecting delay in seeking treatment in patient with breast cancer in Kerman, South-east of Iran. Methods: In this cross sectional study, 80 cases (with delay time less than 3 months) and 80 controls (patients with delay time more than 3 months) were enrolled. A questionnaire including demographic characteristics, knowledge, attitude, and Health belief model (HBM) subscales was used for data collection after reliability and validity assessment. Results: The majority of the patients were housewives (73.2%) and most of the patients lived in urban areas (63.7%). The results of multivariate logistic regression showed that there was a significant relationship between the perceived barriers OR = 1.48 (CI 95% = 1.18 - 1.86), cues to action OR = 0.72 (CI 95% = 0.55 - 0.93), perceived susceptibility OR = 0.87 (CI 95% = 0.78 - 0.97), and the first symptom OR = 0.259 (CI 95% = 0.08 - 0.79) with delay in seeking treatment in patients with breast cancer. Conclusions: According to the results, health belief and knowledge about breast cancer were two important factors affecting delay in treatment seeking in patients with breast cancer in Kerman, Iran. In order to reduce this delay, appropriate health education programs should be performed. Iodine-131 therapy has been known as one of the main strategies in the treatment of thyroid diseases such as hyperthyroidism and thyroid cancer (1). The most important therapy in patients with differentiated thyroid carcinoma (DTC) is thyroidectomy, usually followed by radiation therapy by I-131. Although this method is considered safe, it has some reported side effects. The therapeutic effect of iodine-131 is the result of beta and gamma radiations, which is damaging to cells with direct or indirect manner (2, 3). Most of Iodine-131 concentrates on residual thyroid tissue and kills tumor cells; however, it has several side effects such as radiation thyroiditis, sialadenitis, xerostomia, neck pain and edema, gastrointestinal symptoms (4), pulmonary problems, and defects in hematopoietic systems, nasolacrimal glands, and gonadal dysfunction, as well as second early malignancies (5, 6). The late complications like secondary cancers. These complications, seen after treatment with therapeutic dose of radioiodine (100 - 150 mCi), are rarely deadly, but they can affect the patient’s quality of life (7, 8). I-131 may also induce genetic damage and chromosomal instability in normal cells. Iodine 131 beta particles have the most important role in cytotoxic effects (9, 10). Ionizing radiation causes cellular damage mainly by producing reactive oxygen species (ROS), that can induce lipid peroxidation and damage to cell membranes and critical macromolecules such as DNA that lead to genetic damage (11, 12). Recently, in vitro and in vivo studies showed radiosensitizing and radioprotective effects by some herbal chemicals and synthetic medications (13). One of these radioprotective photochemical is curcumin. Curcumin is the yellow polyphenol extracted from the rhizome of turmeric (Curcumalonga) (14). Curcumin has radioprotective, antioxidant, anti-inflammatory, anti-proliferative, anti-atherosclerotic, and pro-apoptotic effects in cancer cells (15). Curcumin prevents ROS forming and also scavenging free radicals and may protect the cells from toxicity that cause by reactive oxygen spices. Curcumin also increases the activities of antioxidant enzymes like superoxide dismutase (SOD), catalase, and glutathione peroxidase (GSH-Px). Accordingly, curcumin may have beneficial effects against radiation toxicity by scavenging free radicals and produce antioxidant factors (16, 17). Oral curcumin is poorly absorbed from the bowel. However, the absorption of curcumin can be increased by newer formulations (i.e. complex with piperine, nanoparticles, micelles, liposomal formulations, etc.) (18). The use of nanoparticles as drug carriers has several advantages compared with another formulation. This nanoparticle can also cross the blood brain barrier (19). Cytokinesis-block micronucleus assay in peripheral blood lymphocytes have been used for a long time as a biomarker of early effects of genotoxic carcinogens. Micronuclei (MN) are small, extra nuclear bodies that contain damaged chromosome/chromatid fragments (20). There are lots of studies that reported increase in the percentage of MN in peripheral lymphocytes of patients during radioiodine therapy (21-25). Based on our knowledge and research, there is no study to report any effectiveness of nano-curcumin treatment in reducing the genotoxic damage in patients with DTC under radioiodine therapy. The aim of this study was to evaluate, in a double-blind placebo-controlled manner in patients with DTC after their first therapeutic dose of I-131, the effect of curcumin on complete blood counts with differential, platelet counts, and hemoglobin levels with chromosomal damages in peripheral blood lymphocyte by micronuclei assay. This study was performed in 21 patients (11 women and 10 men, median age 44.95 years; range 24 - 79) (Table 1), who had undergone total thyroidectomy for DTC. None of the patients had previously been treated with external radiotherapy or I-131, and they did not suffer from any other illness except thyroid carcinoma without distant metastasis. This study was performed after obtaining permission from medical ethics committee of the university (Sbmu.rec.1393.797) and registered with Iranian registry of clinical trials (IRCT2016020526377N1). All patients provided written informed consent for participation. Abbreviations: F, Females; HGB, Hemoglobin; M, Males; MN, Micronuclei; RBC, Red Blood Cell; Tg, Thyroglobulin; TSH, Thyroid Stimulating Hormone; WBC, White Blood Cell. aAge is expressed as median (range) and other parameters as mean ± SD. bMN: count of MN in 1000 BN lymphocytes. Randomization was performed in a double-blind fashion by administrative personnel outside the research project. Eleven patients (6 women; median age 43.45 years, range 27 - 56) were assigned to receive nano-curcumin capsules; 10 patients (5 women; median age 46.6 years, range 24 - 77) received placebo (Table 1). Nano-curcumin (Nano-micellar soft gel, red and flavorless capsules) was prepared from Elixir Nano Sina company (Iran). The details about synthesis and characterization of this drug have been reported in articles (26). A dose of 160 mg/day nano-curcumin or placebo was orally given at regular intervals from 3 days before up to 7 days after I-131 therapy. Patients received a thyroid remnant ablation dose of 5.5 GBq (150 mCi) I-131 (Box 1). Inclusion criteria: All patients with differentiated thyroid cancer (follicular, papillary or mixed type) not receiving destroying dose (ablative dose) of radioiodine up to now; no palpable neck mass; thyroid pathology reported with no invasion to capsular and lymph areas and blood vessels; body scan with I-131 not showing any functional tissue in regions other than the thyroid bed; thyroid cancer confirmed by biopsy; all patients have total thyroidectomy; TSH level before administration of radioiodine is higher than 30 IU/mL. Exclusion criteria: After treatment with I-131, if there is abnormal tissue absorption of iodine in other areas of the thyroid bed; if patients after taking the first capsule of curcumin had a headache and dizziness. Blood samples (5 mL) were collected in heparinized sterile tubes from median cubital vein of patients before treatment and one week after radioiodine therapy. Complete blood counts with differential, platelet counts, and hemoglobin levels were obtained at baseline. Magnitude of changes from baseline in the hematological parameters was determined and compared. We also determined the blood parameters (serum thyroid stimulating hormone (TSH), thyroglobulin (TG), and anti-TG). A 0.5 mL of blood sample (curcumin and placebo groups) was added to 4.5 mL of roswell park memorial institute (RPMI)-1640 culture medium (Gibco, USA), which contained 10% fetal calf serum, 2 mM glutamine (Gibco, USA), 0.1 mL/5 mL phytohemagglutinin (Gibco, USA), and antibiotics (Penicillin 100 IU/mL, Streptomycin 100 µg/mL) (Gibco, USA). Two paired cultures were set up for each blood sample and incubated at 37 ± 1°C. After 44 hours of culturing, Cytochalasin B (Sigma, final concentration: 5 µg/mL) was added to block cytokinesis induced by phytohemagglutinin. Cells were harvested at the end of 72 hours of incubation and extraction by centrifugation. They were treated by KCl 0.075 M and, then, fixed in fixative solution 3 times (methanol: acetic acid, 6:1). Next, we re-suspended and the suspension was dropped onto cold glass slides and allowed to dry. Fixed cells were stained with Giemsa (Merck, Germany) solution (10%). All slides were coded and checked at 40 × magnification for the micronuclei frequency in bi-nucleated cells with well-preserved cytoplasm. Counted micronuclei must have a diameter between 1/16th up 1/3rd of main nuclei, be non-refractile, and stick to or overlap with the main nuclei (27). At each blood collection end point, at least 1000 bi-nucleated cells before and after radioiodine therapy cultures from each patient were examined to record the frequency of micronuclei. Statistical package (SPSS 16) was used for the data analysis. Data were expressed as mean ± SD unless otherwise stated and were tested for normal distribution (Shapiro-Wilk test). Paired sample t test was used for the comparison of micronuclei frequency in each group (curcumin and placebo) before and after therapy. We used independent sample t test to determine the difference between the frequency of MN between curcumin and placebo groups after radioiodine therapy. Statistical significance was assumed for P < 0.05. The demographic and biochemical characteristics of the patients are summarized in Table 1. At baseline, patients in the two groups (curcumin and placebo) were comparable for gender, age, serum TSH, thyroglobulin (TG), anti-TG, and the differences were non-significant. Based on the findings of this study, gender is unaffected in the frequency of micronuclei (12.1 ± 5.8 vs. 11.1 ± 2.5; P > 0.05) (Figure 1). Nano-curcumin administration was clinically safe and there was no evidence of side effects during our study. Figure 1. Comparison the frequency of MN in patients in placebo and curcumin groups at baseline (before) and after radioiodine (131I) therapy. In vivo protection by curcumin against radiation-induced genetic damage induced by 131I (I) in whole blood lymphocyte. The data represent average ± standard deviation. At baseline, the mean frequency of peripheral blood lymphocyte MN was approximately the same between the two groups of patients and did not differ; comparison of the frequency of MN in patients after 7days of radioiodine therapy showed the significant differences (20.72 ± 7.1 vs. 31.5 ± 9.0; P = 0.006). At baseline, the mean frequency of MN was approximately the same in both groups (10.81 ± 4.1 vs. 12.5 ± 4.5; P > 0.05) (Figure 1). The time course for the frequency of MN in human lymphocytes for each patient in the two groups is shown in Figure 1. 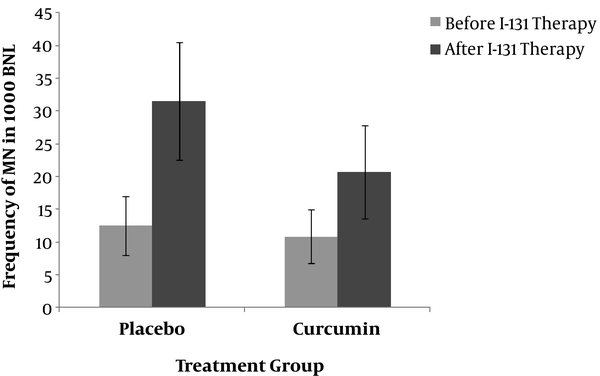 The frequency of MN in the placebo group one week after I-131 treatment (31.5 ± 9.0; P = 0.000 vs. baseline) and the frequency of MN in curcumin treated group after 7 days was significantly increased compared to before I-131 therapy (20.72 ± 7.1; P = 0.001 vs. baseline) (Figure 1). The frequency of MN after one week of radioiodine therapy in curcumin subjects was significantly lower than placebo group (20.72 ± 7.1 vs. 31.5 ± 9.0; P = 0.006) (Figure 1). Total micronuclei frequencies were reduced by 32.4% in patients treated with curcumin compared to placebo group. Most patients with DTC are treated with I-131 after thyroidectomy to ablate remnant tissue (5). The TSH level in all patients before the administration of radioiodine was more than 30 IU/mL (Table 1). In some patients, the primary goal of the first dose of I-131 treatment is adjuvant therapy to decrease the risk of recurrence or treat persistent disease (28). Induction of oxidative stress is one of the main mechanisms operative in the therapeutic and/or side effects of iodine-131 (10). Monterio Gil et al. (26) investigated DNA damage induced by radioiodine therapy in peripheral blood lymphocytes in patients with thyroid cancer. The number of micronuclei in the cells increased after 1 month of treatment. Ballardin et al. (27) observed 4-fold increase in the frequency of micronuclei 7 days after radioiodine therapy in patients. In nuclear medicine, chromosomal damage following radioiodine therapy has been reported in many studies (29-31). It seems that at least 1 week after the administration of radioactive iodine-131 is a good time to evaluate cell damage in blood peripheral lymphocytes induced by radiation (30). In this study, we have also observed genotoxic effects in lymphocytes (2.52-fold increase) after 7days after radioiodine therapy. The use of natural compounds to reduce the frequency of micronuclei induced by internal irradiation by radiation of I-131 is recently developed. Shafaghati et al. (1) incubated human lymphocytes with curcumin, at doses of 5, 10, and 50 µg/mL to investigate the radioprotective effects against the genotoxic damages in peripheral lymphocytes. After 1 hour, the lymphocytes were incubated with I-131 (100 µCi/1.5 mL) for two hours and maximum protective effects in micronuclei frequency were observed at the dose of 50 µg/mL curcumin with 52% reduction. There are a limited number of clinical trials investigating the radioprotective effects of herbal chemicals on the side effects induced by radioiodine therapy. Based on our knowledge and researches, the present study for the first time as a clinical trial shows that nano-curcumin supplementation is effective in the reduction of genotoxic damages by radiation in patients with DTC. The current study confirms that I-131 therapy can induce a significant direct genotoxic damage characterized by the increase of MN in peripheral lymphocytes from patients with DTC in control groups. Dardano et al. (2) also showed this increase of MN (about 3 fold) in control groups without any radioprotectors materials. They have proved a significant protective effect of Ginkgo biloba extract (GBE) in patients with Graves’ disease and DTC receiving I-131 therapy for their treatments (2, 32). The results of the present research also confirm that the administration of curcumin to the patients, at the current dose, was able to prevent the increase of MN about 34.2% compared with the control group. Several studies have found a relationship between antioxidant properties of curcumin and anti-oxidative stress in cells. Curcumin showed a strong capacity to scavenging intracellular small oxidative molecules such as H2O2, HO, and ROO. There are no reports of toxicity of curcumin in oral administration (32, 33). Curcumin plasma level range was from 29 to 419 ng/mL (33), and 22 to 42 ng/mL after 2 to 6 hours after single dose (32). Because of poor oral bioavailability of curcumin, some new studies focused on the formulation of this natural product in nano-micelles and water soluble to increase the absorption by intestine (32, 33). The administration of nano-curcumin showed the higher serum level of curcumin in blood and soft tissues. The half-life of curcumin in nano-micelles form in blood serum is about 6 to 7 hours after the first dose and the stability in the stomach is up to 72 hours; however, the peak of effectiveness is about 2 to 3 after single dose. The doses were selected on the basis of results from publication (34). Bone marrow suppression is often a transient effect of radioiodine therapy. It shows decrease in WBC and platelet count for up to 6 to 10 weeks (35), but in this study, there were no significant differences between the two groups in terms of 4 parameters (WBC, RBC, platelets, and hemoglobin level) at baseline and after 1 week. We recommended that follow-up for 1, 3, and 6 months after therapy may show the differences. The findings of this study show that curcumin may protect from possible oxidative and genotoxic damage induced by I-131 treatment. The main limitations of the current study were its sample size; so, further studies with larger cohorts of patients are needed to confirm this report. It should be underlined that the focus of interest of this study was to evaluate the radioprotective effects of curcumin after I-131 therapy, just in patients’ blood samples by the amount of MN frequency. But, for other effects, more follow-ups are needed. The authors wish to thank all of the patients with breast cancer, who cooperated in this study. Authors’ Contribution: Narges Khanjani suggested the topic, helped in conception and design of the study, supervised data collection, supervised data analysis, helped in interpreting the data and writing the final draft, edited, and commented on the final text. Hadis Rastad helped in writing the proposal, gathered the data, did the data analysis, and helped in writing the final draft. Maryam Saber helped in writing the proposal, cooperated and supervised in the construction of the questionnaires, helped in interpreting the data, and edited the final text. Behjat Kalantari Khandani helped in writing the proposal, helped in recruiting patients from the oncology clinic, helped in data collection and interpreting the data, and edited the final text. Leila Tavakkoli helped in organizing and interpreting the data and writing and editing the final draft. Funding/Support: This study was funded by Kerman University of Medical Sciences. 1. Coughlin SS, Ekwueme DU. Breast cancer as a global health concern. Cancer Epidemiol. 2009;33(5):315-8. doi: 10.1016/j.canep.2009.10.003. [PubMed: 19896917]. 2. Khanjani N, Hoving JL, Forbes AB, Sim MR. Systematic review and meta-analysis of cyclodiene insecticides and breast cancer. J Environ Sci Health C Environ Carcinog Ecotoxicol Rev. 2007;25(1):23-52. doi: 10.1080/10590500701201711. [PubMed: 17365341]. 3. Khanjani N, English DR, Sim MR. An ecological study of organochlorine pesticides and breast cancer in rural Victoria, Australia. Arch Environ Contam Toxicol. 2006;50(3):452-61. doi: 10.1007/s00244-004-7217-5. [PubMed: 16489419]. 4. Khanjani N, Jafarnejad AB, Tavakkoli L. Arsenic and breast cancer: a systematic review of epidemiologic studies. Rev Environ Health. 2017;32(3):267-77. doi: 10.1515/reveh-2016-0068. [PubMed: 28284039]. 5. International-Agency-for-Research-on-Cancer . GLOBAL 2012: Estimated Cancer Incidence, Mortality and Prevalence Worldwide in 2012: World-Health-Organization. 2012. Available from: http://globocan.iarc.fr/Pages/fact_sheets_population.aspx. 6. World-Health-Organization . Towards a strategy for cancer control in the Eastern Mediterranean Region. 2009. 7. World-Health-Organization . Cancer Country Profile (Iran). 2014. Available from: http://www.who.int/cancer/country-profiles/irn_en.pdf?ua=1. 8. Ziaei JE, Sanaat Z, Asvadi I, Dastgiri S, Pourzand A, Vaez J. Survival analysis of breast cancer patients in northwest Iran. Asian Pac J Cancer Prev. 2013;14(1):39-42. doi: 10.7314/APJCP.2013.14.1.39. [PubMed: 23534759]. 9. Rafati M, Ghotbi M, Ahmad Nia H. Principle of disease prevention and surveillance. Surveillance Systems of Non-Communicable Diseases; 2008. 10. Richards MA, Westcombe AM, Love SB, Littlejohns P, Ramirez AJ. Influence of delay on survival in patients with breast cancer: a systematic review. Lancet. 1999;353(9159):1119-26. doi: 10.1016/S0140-6736(99)02143-1. [PubMed: 10209974]. 11. Montazeri A, Vahdaninia M, Harirchi I, Harirchi AM, Sajadian A, Khaleghi F, et al. Breast cancer in Iran: need for greater women awareness of warning signs and effective screening methods. Asia Pac Fam Med. 2008;7(1):6. doi: 10.1186/1447-056X-7-6. [PubMed: 19099595]. [PubMed Central: PMC2628874]. 12. Kalantari Khandani B, Tavakkoli L, Khanjani N. Metastasis and its Related Factors in Female Breast Cancer Patients in Kerman, Iran. Asian Pac J Cancer Prev. 2017;18(6):1567-71. doi: 10.22034/APJCP.2017.18.6.1567. [PubMed: 28669169]. 13. Burgess C, Hunter MS, Ramirez AJ. A qualitative study of delay among women reporting symptoms of breast cancer. Br J Gen Pract. 2001;51(473):967-71. [PubMed: 11766868]. [PubMed Central: PMC1314188]. 14. Davoodi S. Public health challenges in Iran. Ebtekar Danesh; 2008. 15. Montazeri A, Ebrahimi M, Mehrdad N, Ansari M, Sajadian A. Delayed presentation in breast cancer: a study in Iranian women. BMC Womens Health. 2003;3(1):4. doi: 10.1186/1472-6874-3-4. [PubMed: 12846932]. [PubMed Central: PMC166160]. 16. Ghaem Maghami F, et al TP6P[. [Delay in referring and related factors in patients with advanced breast cancer - Emam Hospital (2000)]. Tehran Univ Med J. 2002;60(2):157-64. Persian. 17. Fouladi NF. Daneshian, The affecting factors of the delays before diagnosis, diagnosis and treatment of the patients with breast cancer using the Anderson model. Ardabil University of Medical Sciences; 2014. Persian. 18. Qorban Sabbagh M, Khanjani N, Fadakar MM, Iranpour A. [Empowerment of women visiting the health centers of Kerman by teaching Self Breast Examination in the presence of Behvarz]. Iran Q J Breast Dis. 2014;7(1):41-51. Persian. 19. Rezabeigi-davarani E, Khanjani N, Falahi M, Daneshi S, Iranpour A. Breast self-examination and its effective factors based on the theory of planned behavior among women in Kerman, Iran. J Educ Community Health. 2017;3(3):1-8. doi: 10.21859/jech-03031. 20. Ashrafi Asgarabad A, Khanjani N, Saber M, Jalili S, Khedmati E. [Knowledge and attitude of students at alzahra university about breast self-examination, Iran]. J Health Dev. 2012;1(2):112-20. Persian. 21. Rastad H, Khanjani N, Khandani BK. Causes of delay in seeking treatment in patients with breast cancer in Iran: a qualitative content analysis study. Asian Pac J Cancer Prev. 2012;13(9):4511-5. doi: 10.7314/APJCP.2012.13.9.4511. [PubMed: 23167370]. 22. Harirchi I, Ghaemmaghami F, Karbakhsh M, Moghimi R, Mazaherie H. Patient delay in women presenting with advanced breast cancer: an Iranian study. Public Health. 2005;119(10):885-91. doi: 10.1016/j.puhe.2004.11.005. [PubMed: 15913679]. 23. Neale AV, Tilley BC, Vernon SW. Marital status, delay in seeking treatment and survival from breast cancer. Soc Sci Med. 1986;23(3):305-12. doi: 10.1016/0277-9536(86)90352-7. [PubMed: 3764489]. 24. Lannin DR, Mathews HF, Mitchell J, Swanson MS, Swanson FH, Edwards MS. Influence of socioeconomic and cultural factors on racial differences in late-stage presentation of breast cancer. JAMA. 1998;279(22):1801-7. doi: 10.1001/jama.279.22.1801. [PubMed: 9628711]. 25. Thongsuksai P, Chongsuvivatwong V, Sriplung H. Delay in breast cancer care: a study in Thai women. Med Care. 2000;38(1):108-14. doi: 10.1097/00005650-200001000-00012. [PubMed: 10630725]. 26. Facione NC. Delay versus help seeking for breast cancer symptoms: a critical review of the literature on patient and provider delay. Soc Sci Med. 1993;36(12):1521-34. doi: 10.1016/0277-9536(93)90340-A. [PubMed: 8327915]. 27. Ramirez AJ, Westcombe AM, Burgess CC, Sutton S, Littlejohns P, Richards MA. Factors predicting delayed presentation of symptomatic breast cancer: a systematic review. Lancet. 1999;353(9159):1127-31. doi: 10.1016/S0140-6736(99)02142-X. [PubMed: 10209975]. 28. Ebrahimi M, Vahdaninia M, Montazeri A. Risk factors for breast cancer in Iran: a case-control study. Breast Cancer Res. 2002;4(5):R10. doi: 10.1186/bcr454. [PubMed: 12223127]. [PubMed Central: PMC125302]. 29. Facione NC, Miaskowski C, Dodd MJ, Paul SM. The self-reported likelihood of patient delay in breast cancer: new thoughts for early detection. Prev Med. 2002;34(4):397-407. doi: 10.1006/pmed.2001.0998. [PubMed: 11914045]. 30. Montella M, Crispo A, D'Aiuto G, De Marco M, de Bellis G, Fabbrocini G, et al. Determinant factors for diagnostic delay in operable breast cancer patients. Eur J Cancer Prev. 2001;10(1):53-9. doi: 10.1097/00008469-200102000-00006. [PubMed: 11263591]. 31. Arndt V, Sturmer T, Stegmaier C, Ziegler H, Dhom G, Brenner H. Socio-demographic factors, health behavior and late-stage diagnosis of breast cancer in Germany: a population-based study. J Clin Epidemiol. 2001;54(7):719-27. doi: 10.1016/S0895-4356(00)00351-6. [PubMed: 11438413]. 32. Grunfeld EA, Ramirez AJ, Hunter MS, Richards MA. Women's knowledge and beliefs regarding breast cancer. Br J Cancer. 2002;86(9):1373-8. doi: 10.1038/sj.bjc.6600260. [PubMed: 11986766]. [PubMed Central: PMC2375381]. 33. Sainsbury R, Johnston C, Haward B. Effect on survival of delays in referral of patients with breast-cancer symptoms: a retrospective analysis. Lancet. 1999;353(9159):1132-5. doi: 10.1016/S0140-6736(99)02374-0. [PubMed: 10209976]. 34. Harirchi I, Ebrahimi M, Zamani N, Jarvandi S, Montazeri A. Breast cancer in Iran: a review of 903 case records. Public Health. 2000;114(2):143-5. doi: 10.1038/sj.ph.1900623. [PubMed: 10800155]. 35. Grunfeld EA, Hunter MS, Ramirez AJ, Richards MA. Perceptions of breast cancer across the lifespan. J Psychosom Res. 2003;54(2):141-6. doi: 10.1016/S0022-3999(02)00522-6. [PubMed: 12573735]. 36. de Nooijer J, Lechner L, de Vries H. Social psychological correlates of paying attention to cancer symptoms and seeking medical help. Soc Sci Med. 2003;56(5):915-20. doi: 10.1016/S0277-9536(02)00098-9. [PubMed: 12593866]. 37. Kumari P, Goonewardena CSE. Delay among women reporting symptoms of Breast cancer. J College Community Physicians of Sri Lanka. 2011;16(1):17. doi: 10.4038/jccpsl.v16i1.3867. 38. Manly-Lampkin S. Understanding Delay in Breast Cancer Diagnosis in Diverse Young Women. 30th Annual Oncology Nursing Society Congress. Orlando, Florida, USA. 2005. 39. Meechan G, Collins J, Petrie KJ. The relationship of symptoms and psychological factors to delay in seeking medical care for breast symptoms. Prev Med. 2003;36(3):374-8. doi: 10.1016/S0091-7435(02)00053-1. [PubMed: 12634028]. 40. Burgess CC, Potts HW, Hamed H, Bish AM, Hunter MS, Richards MA, et al. Why do older women delay presentation with breast cancer symptoms? Psychooncology. 2006;15(11):962-8. doi: 10.1002/pon.1030. [PubMed: 16511900]. 41. Khanjani N, Noori A, Rostami F. The knowledge and practice of breast cancer screening among women in Kerman, Iran. Al-Ameen J Med Sci. 2012;5(2):221-6. 42. Coates AS. Breast cancer: delays, dilemmas, and delusions. Lancet. 1999;353(9159):1112-3. doi: 10.1016/S0140-6736(99)00082-3. [PubMed: 10209969]. 43. Zola IK. Pathways to the doctor-from person to patient. Soc Sci Med. 1973;7(9):677-89. doi: 10.1016/0037-7856(73)90002-4. [PubMed: 4749058]. 44. Cameron L, Leventhal EA, Leventhal H. Seeking medical care in response to symptoms and life stress. Psychosom Med. 1995;57(1):37-47. doi: 10.1097/00006842-199501000-00006. [PubMed: 7732157].